With unusually dry winter conditions, I was about 3.5 miles from Sherman Pass in mid-January on the western side of the Southern Sierra. The road was open and clear to the 8,000-foot level and I had driven in the night before to spend the night off the side of the road. 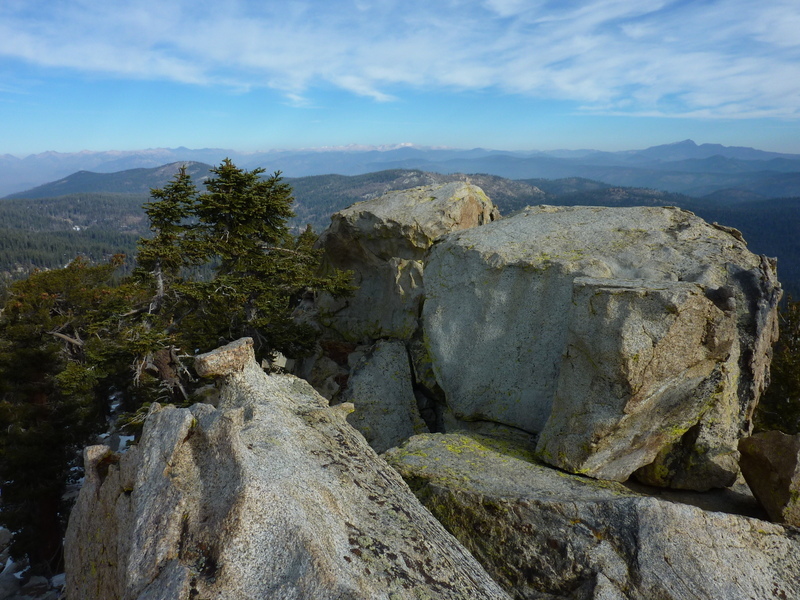 My primary goal was to reach an unnamed summit just north of Sirretta Peak with 1,000ft of prominence and at nearly 10,000ft, the highest point in the Sierra south of Olancha Pass. The shortest approach is from Big Meadow, south of the peak, but I wasn't sure the gates would be open at this time of year. It looked like a reasonable alternate route could be taken from Sherman Pass Rd to the north, following the road to Round Meadow, about 5 miles one way. This was the route I plannned to follow and was up by 5a so that I could get an early headlamp start around 5:30a. I had about three miles of hiking up the road before reaching the FS road junction to Round Meadow. There were sections of ice on the pavement that prevented me from driving to this junction and without chains I didn't want to risk slipping off the roadway. The road to Round Meadow had no ice but 3-4" of partially consolidated snow. Someone had driven in about 1/3 mile, but the tracks ended where they had decided it was becoming too risky. This left me without a compacted track to follow and without snowshoes it was somewhat burdensome. I managed only a bit less than another mile along the road before deciding it was more trouble than it was worth. Finding only partial coverage off the road, I headed upslope hoping for better. This was only somewhat successful. I spent the next hour covering only about a mile, climbing to nearly 10,000ft and finding more snow along the ridgeline than I might have hoped for. I checked the GPS and found I was still 2.5 air miles from my destination and concluded it could easily take another 3-4 hours to reach the peak. I was very much regretting that I had neglected to bring snowshoes along on this trip. After some time deliberating, I decided it was unwise to continue on my current trajectory and started making an alternate plan. The alternate plan was not long in coming. I had noted over the last hour that there was a good deal of fun-looking rocky scrambling to be had at various places along the ridge I had traveled. Until now I had bypassed these by traversing the base on the west side. But looking back, it seemed some of these might qualify for minor peaks. My second goal of the day was to reach Sherman Peak, so it seemed a good fit to simply follow the crest back north to Sherman Pass, tagging the highest point I could find. This turned out to be officially unnamed Peak 9,945ft about a mile southeast of Sherman Pass. I reached this point shortly after 9:30a, finding some fun scrambling along the way much as I had hoped, and was surprised to find a register there. Andy Smatko and Bill Schuler had visited in 1997 and left one of Andy's signature registers in a tiny container. Nathan Schultz, an active hiker in the Kern River area, had left a more conventional register in 2009 and had already made six trips to the summit before I arrived. Smatko had dubbed the summit "Bass Peak". The drainage on the east side of the ridge is Trout Creek, so perhaps the name derived somehow from that, but in any case it was good enough for me. After signing the register I put it back where I'd found it and continued north along the ridge. I found dozens of closely spaced ducks leading along the way north to Sherman Pass, following just on the west side of the ridgeline. They seemed to serve almost no purpose as they mostly led through a slab and boulder field where pretty much any route would do. I made a point of "naturalizing" those that I came across. It was nearly 10:30a by the time I reached Sherman Pass. Here I found the snow coverage thin enough to realize I could have easily reached it in the van with chains. There is a nice view spot at a large turnout just east of the pass where one can see Mt. Whitney and Olancha Peak across the Golden Trout and Dome Lands Wildernesses. The Cannell Trail passes through Sherman Pass as well. A fairly modern cattle fence can be found stretching south of the pass - seems there are few places in the Southern Sierra where cattle don't graze. Update Oct 2014: I've since spent some time doing data entry on Andy Smatko's hand-written list of Sierra peakbagging. He named more than 100 summits after some form of his and his companions' names. This one is similarly named: Bill, Andy, Schuler, Smatko. It was Andy's last year in the Sierra. He visited nearby Sherman Peak twice this year - making his 5th and 6th ascents. The only other peak he visited as often was Chocolate Peak. The Sherman Peak Trail starting from the pass makes the summit an easy two mile hike in most seasons. I started off by following the trail, but as much of it is found on the snowier northeast side of the ridge where the postholing proved slow and annoying, I switched to cross-country travel along the southwest side of the ridge. There were remnants of an older trail here but the cross-country was easy enough without it. The summit is crowned with several small communication towers, an old wooden shack and a more modern equipment shed made of steel. The highpoint is found behind these to the the northwest in a large rock cluster where a triangulation station is found. There was no register that I could find, but the views make the hike worthwhile. One can see around the Southern Sierra in all directions for many, many miles on a clear day. On the return I used an alternate route, mostly following an OHV route on the south side of the peak leading down to Sherman Pass Rd. Initially I dropped cross-country down the snow-free southwest face with minimal bushwhacking until I met the OHV road. I spotted quite a bit of new plant growth sprouting up between the rocks on the slope heading down, evidently the flora believing spring to be just around the corner (it would be buried again in snow in a few weeks' time). As I reached the OHV road I heard the droning of a helicopter behind me near the summit. The craft circled around the summit a few times before flying off overhead. I imagined them looking down on me as I waved, but I'm pretty sure I was fairly invisible from that height. An old cabin is encountered about halfway down from the summit. The cabin appears to be in public use, perhaps by hunters or OHV enthusiasts. As is typical for such arrangements, it's maintenance is irregular and minimal, the insides sparsely furnished with old throwaways. Solar-powered electric lights had been installed, but these appeared to be non-functioning when I tested them. It had a workable wood-burning stove at least to keep out the chill of cold night at 9,000ft. The McNally fire of 2002 had swept over the mountain and most of the surrounding area some years ago, the results of which were still evident. Dead snags stood everywhere, slowly falling down with wind and decaying roots, even as new trees were emerging through the thick brush. One snag had fallen over the road in a way to prevent all but motorcycle traffic (and perhaps snowmobiles, if there was any snow). There had been only a few cycle tracks since it had fallen over the past month or two. It was 12:50p by the time I reached the Sherman Pass Rd with another 15 minutes of hiking up the road to the car. Without chains or snowshoes, that was about as much as I could manage in the area, so after tossing my gear in the van, I headed back down to the Kern River. Speas Ridge lies at the north end of the Greenhorn Mtns where it drops down to the Kern River near the small community of Johnsondale. Though 3,000ft lower, the bump that rises more than 750ft before dropping to the river has the same prominence as Sherman Peak. The 7.5' topo shows a trail starting from Johnsondale going up to a saddle west of the highpoint where it forks. The right fork heads west up the ridge for several miles to the pavement of Forest Rte 23S16 near Indian Rock. The left fork drops down the other side of the saddle through Flynn Canyon to the Kern River at Fairview. The highpoint lay about a mile east of the saddle, cross-country through brush of uncertain difficulty. There is some mention of these various trails in guidebooks and online resources, but the fact of the matter is they have been for the most part unmaintained since the McNally fire which incidently started at the southern terminus of this trail where it meets the Kern River behind McNally's restaurant. Heavy brush has grown up where mature forest once stood and the trails have suffered from more than a decade of neglect. Despite this, or perhaps because of it, I found this outing to be the best adventure of the day. Just finding the start of the trail in Johnsondale is no easy feat. Johnsondale does not appear to be a thriving community. Founded as a lumber town and mill, the mill shut down in 1979 for economic reasons, including the creation of the Golden Trout Wilderness which reduced the available lumber stock for the mill and town. The town was purchased whole in 1984, reopening in 1989 as the R-Ranch, a vacation resort. Sold along the lines of resort condos, the 80 cabins and slots for 150 RVs are shared by some 2,000 owners on a part-time basis. There is a general store open to the public along with a large swimming pool and 4 tennis courts. There was almost no one around when I drove in around 1:30p trying to find the trailhead. I found a couple of security guys chatting at the entrance kiosk and stopped there to ask them directions. The unmarked road I had driven in on was the Forest Service Road, everything else on both sides was part of the resort until I reached the locked gate just up the road. They were helpful in telling me where I could park, but had no clue what I was talking about in regards to the Speas Ridge Trail. That the road was gated for the season was only a minor inconvenience as the trail "starts" just across the bridge where the gate is found. I put that in quotes because there are no signs or anything of note I could find along the road to indicate its start. The GPS was somewhat helpful in showing me where the trail used to start. Behind a large rundown USFS shed and a couple of vandalized and abandoned trailers I found some pink flagging that I guessed marked the start of the trail. This was only partially true. I think someone had attempted to mark the old trail, but it didn't really go where it should have. The ribbons led up to a forested area spared in the fire that has a whole series of unmarked equestrian trails that criss-cross through the forest. I followed ones that led roughly in the direction of the original trail as shown on my GPS and in about ten minutes came across the first of two old wooden signs I found tacked to trees. Thus began an hour-long odyssey to follow less than two miles of old trail from Johnsondale up to the saddle on Speas Ridge. Fire-fighting efforts had saved the forest immediately around Johnsondale, but most of Speas Ridge was thoroughly burned. Snags and heavy brush dominate the slopes. Buckthorn and manzanita now rule where once stood mature forest. It will be some time before the small pines seen poking through the brush grow up and once again dominate the scene. The first mile of trail was easy enough to follow, but it was lost entirely in a gully where I could find no real trace of it. I wandered left and right of the trail looking to regain it or find another way to get through the brush. More than a few times I thought I would have to give up, but my perseverence paid off. I came across a large tree that had been cut where it fell across the old path, the only remnant of the trail in the immediate area. A few hardy souls must have plowed their way through over the years because enough of their efforts were evident to allow me to find my way to the saddle in about an hour. At the saddle there were two additional old signs marking the trails and a partial view looking south along the Greenhorn Mountains. I was more concerned with the last mile to the highpoint as I feared the cross-country would be much worse than I'd already managed without the old trail to help. But I was happy to find the makings of a modest use trail that helped a good deal in places. Still, it was not easy and that last mile took the full use of an additional hour. The leather gloves I wore were essential through the buckthorn and my pants would be partially shredded in the battle. Blood was drawn all over my legs and a tick latched on that would not be discovered until the following morning. All this for the glory of standing upon the local highpoint on a non-descript ridge in the Kern River Valley. The sun would set before I managed to get back down, but the return went a good deal faster now that I knew the route and I would make it to the van without needing a headlamp.